I've written about the great food I've been eating at restaurants and not of the treats I've been creating in my kitchen. It's time to fix that. One day, my friend who was raised in Utah, lived in France, and whom I met in London convinced me he needed my cooking and baking "expertise" in tackling a culinary project: the "Gâteau Basque. 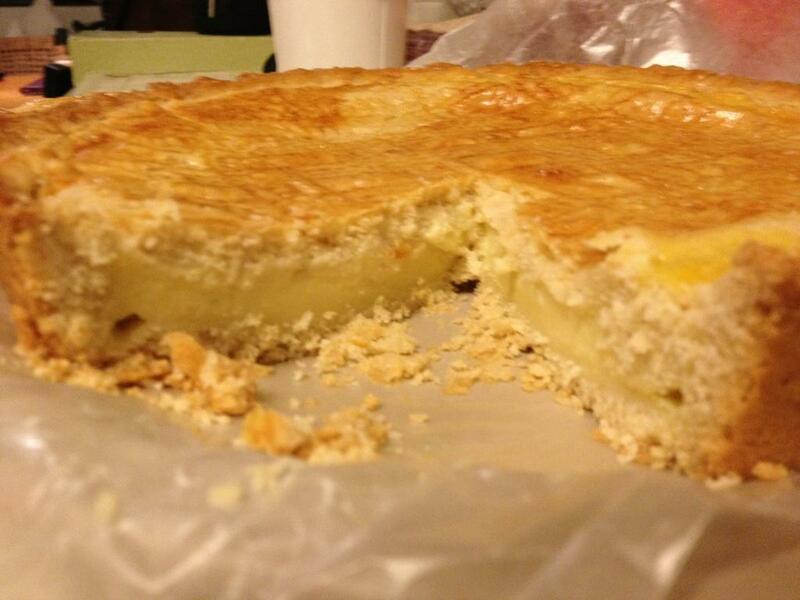 "* Basically, it's a filled "cake" from the Basque Country of France. Well, it must be some special cake 'cause there's even a museum in its honor! (Oh, the French...). What makes a gâteau Basque so intriguing is that the cake has a clue as to what's baked inside. If filled with pastry cream, there's a crosshatch pattern on top. If filled with black cherry jam, another regional specialty, there's a Basque cross — a cross shaped like a rounded pinwheel — baked flat on top. "'A grown-up pop tart,' Greenspan says with a laugh." Uh, a pop-tart with a fancy name? ::rolling up sleeves:: This is so happening. * Let it be fully disclosed that I was more of a hassle than a help in the kitchen. If my poor friend had known this earlier, I'm sure my help would not have been summoned. My numerous blunders not only resulted in a waste of ingredients, but costed us the most valuable ingredient of all: time. Doah-fail. A warning: This is far from a "quick and easy" recipe. In fact, it's pretty laborious. Be prepared to invest several hours in making this delicious treat "from scratch." A few notes: The gâteau basque is traditionally known to have a cherry compote or vanilla/ rum creme filling. We opted for the latter. Also, we ended up making two gâteaux so some of the portions in the photos will look larger than it should be. (i.e. - For our second gâteau, we doubled the filling recipe (and added more rum) because we found the first one didn't have as much flavor or creme as desired). I didn't get a chance to taste the second gâteau, but we were going for a more creamier/ less dry and flaky taste. Recipients of gâteau #2, please let me know your honest opinion. It was all a trial & error process. 2. In a separate bowl, beat the butter and both sugars until smooth (about 4 min. on medium speed if using a hand mixer). Add the egg and beat for another 2 min. Add vanilla and mix for another minute. 3. Reduce the speed to low and add the flour mixture in two or three parts. Mix until the dry and wet ingredients are fully incorporated. When the dough turns doughy, use your hands to mix and knead - it can get messy, but it helps. 4. Divide the dough-ball in half, cover the bowl, and refrigerate for 3+ hours. 5. While the dough chills, mix the milk with vanilla in a saucepan. Bring the vanilla+milk to a light boil. The boiling has gone too far if the milk begins to evaporate and the bottom of the saucepan accumulates am icky, brownish film. 6. In a medium bowl, whisk together the two egg yolks, sugar, flour, and rum until frothy. 7. Once the vanilla+milk is slowly boiling, add to the rum liquid mixture. Return everything to the saucepan on low heat and allow the creme filling to-be to simmer and thicken (about 10-15 min). Don't stir the mixture! 8. Take the cooled dough out of the fridge and let it sit in room temperature for a few minutes. Take one half of the dough and lay it atop a piece of wax paper on a hard surface. Roll out the dough until it forms a circle. Do the same with the other piece. 9. Fit one layer onto the cake pan as if making a pie. You can choose to grease or butter the cake pan, but there is already so much butter in the dough that it is unnecessary. 10. Add the thickened filling (it should have a consistency reminiscent of pudding). Even if the consistency is not quite thick, go ahead and fill the cake pan. The filling should fill up about half the pan. Round two: Mo' creme filling, please! 11. If you want to create some design for the cover layer (like cross-hatching), do so before placing it over the creme-filled pan. Then cover the filling with the second layer of dough. Seal the edges of the bottom and top dough pieces using your fingers. If there are a few holes on the top layer, don't fuss over it too much. I think it adds a rustic touch. 12. Center a rack in the oven and preheat to 350F. 13. Brush, or if you're less sophisticated like us, use your fingers to the top of the dough with the egg glaze. This is so that the final product will have a lovely golden glaze. 14. Place pan into oven and bake for 40 min., or until the top is golden brown. Transfer the cake to a cooling rack and let it rest for about 5 min. Carefully take the cake out of the pan (it's a two-man procedure) and cool for another 15 min. before serving. 15. It's best to eat the gâteau the day it is made. Unlike some pastries that taste better over time, the crust of the gâteau may turn softer and even soggier with each passing day. Some final notes: After hours of slaving away in the kitchen (or really, watching my friend slave away), I was rewarded with a delicious gâteau. The final product looked like a pie, but tasted like a butter cookie. The hint of rum creme was light and subtle. If you'd like a more prominent rum taste, add a small splash or two (not an entire tablespoon) more of the rhum extract. Grab a cup of coffee or milk and enjoy! I just received a report that gâteau #2 (with more filling) is tastier. It sure looks that way -- yay!